What the hell are the Atlanta Braves doing, all t the talk has been about how they need acquire a bat to help their struggling offense and the team’s biggest chip was Javier Vazquez who was OUTSTANDING last season. 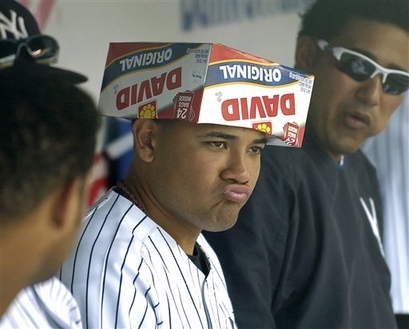 So, in a move to bolster their offense, the Braves move Javier for MELKY CABRERA? WTF? What am I missing here? Why would the Braves look to add an outfielder who, at best, is a 20 HR hitter and has a career OPS+ of 88? They already have Nate McClouth, now they’ve added a WORSE hitter and in exchange gave up a 200 IP, 200+ strikeout, seems like some shrewd management there. Is it possible that Melky was the BEST deal available? That can’t be true, he’s like a shittier, younger Marcus Thames and he just got traded for one of the best starters in the NL the last two seasons. At least when the Yankees acquired Vazquez the first time they included Nick Johnson who can actually perform in the majors. With Jason Heyward, rookie extraordinaire looming, the Braves can have a pretty young outfield in place as early as next season, although, of course, one of those spots will be with Melky who really isn’t good enough to deserve it. This is a GREAT move for the Yankees and the Braves just BLEW it. After all, why would you want to trade a really valuable piece for something USEFUL! I just hope that Vazquez’ previous struggles in NY will return, but so far, the Yankees offseason has been going swimmingly.